German conductor and composer; born at Frankfort-on-the-Main April 19, 1858. He first studied medicine and chemistry at the Polytechnikum of Darmstadt and at Heidelberg University, but later devoted himself entirely to music, studying at the Königliche Hochschule für Musik, Berlin, under Schultze and Rudorff, and later privately under Kiel and Urban. Ochs is the founder and leader of the Philharmonic Choral Society of Berlin. At first an obscure organization, it became prominent through numerous performances given by Von Bülow, an intimate friend of Ochs. 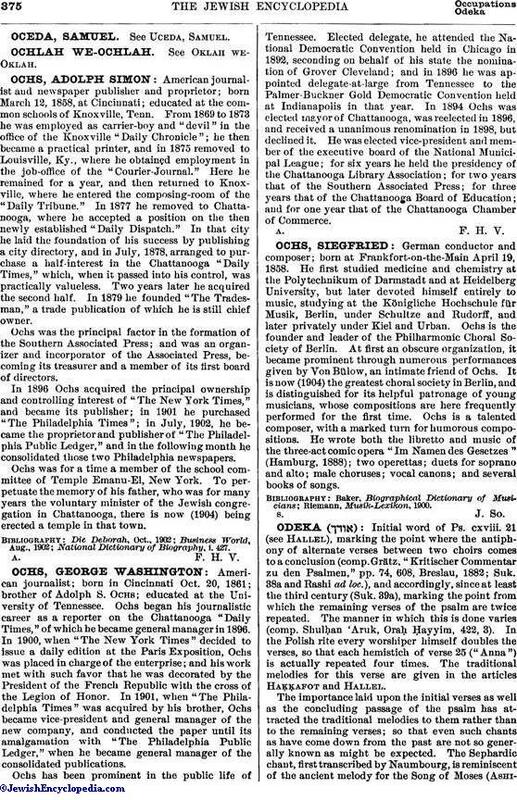 It is now (1904) the greatest choral society in Berlin, and is distinguished for its helpful patronage of young musicians, whose compositions are here frequently performed for the first time. Ochs is a talented composer, with a marked turn for humorous compositions. He wrote both the libretto and music of the three-act comic opera "Im Namen des Gesetzes" (Hamburg, 1888); two operettas; duets for soprano and alto; male choruses; vocal canons; and several books of songs.